Influenster gives free trial products of everything from beauty products to household items. To qualify for programs, you fill out quick product surveys. Once you’ve qualified, they mail the products. Try them and tell people what you think in person and on social media. Complete a short exit survey and review the product(s) on Influenster. The more active you are the more programs you qualify for. Everything received from Influenster is free. Some virtual Voxboxes or multi product packages include coupons to redeem for the product. At times, the coupon will not cover the full amount, but you can opt out of any program that only offers discounts or does not interest you. If you are unfamiliar with Influenster, you can read my overview. See recent Free Sample articles. I can only think of one person who claims not to like samples. Said person gladly accepts ones I give him that he wants to try though. He will not accept any he’s never heard of or is not interested in trying, so a better way to word it is, he does not want to sample anything he has not first researched. There are people who feel the same way. What would you think if I told you not only can you research an item, but you can contact the company for a completely free sample. I am not referring to a gift with purchase, but I actually mean a free sample. You do not even pay for shipping. My fascination with Erno Laszlo began when I read that Audrey Hepburn (one of the most beautiful women of all time) claimed she owed 50% of her beauty to the brand. While I seriously doubt the figure was actually 50%, I do know that some of the most beautiful women in the world have invested in their skin and treated it right. Many say that treating your skin right is as important as genetically gifted skin. If you are 25 or older and have not started investing in your skin, now is the time. Right now, there are two places to try some Erno Laszlo products before investing in the expensive full sizes. 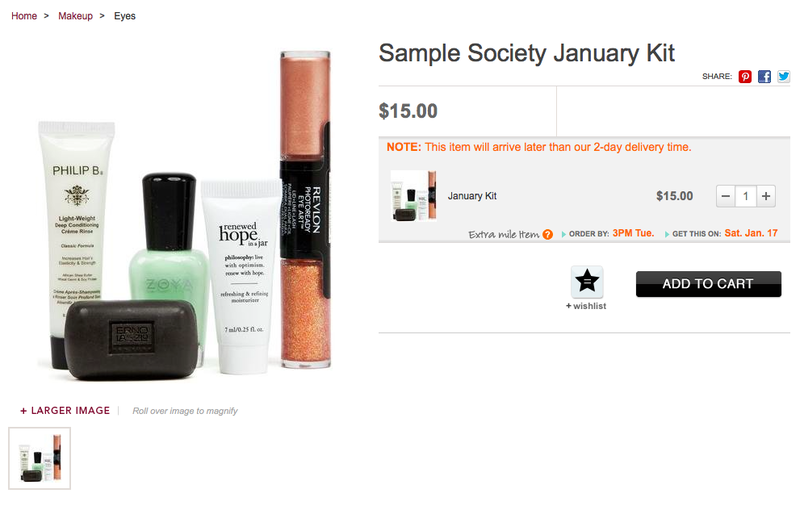 Sample Society by Beautybar just released the January box for people who want it outside of a subscription. In addition to the lovely Erno Laszlo soap, there are some other nice items in the box as well. It retails for $15 plus tax. The best part is shipping is free on these boxes. If you purchase over $300 from Beautybar, use the code BBJAN15 to get $75 off. The other opportunity to test the brand comes from Beauty.com. Spend $10 on the Beauty side, and you will get this three piece Erno Laszlo gift. Shipping is free with a $35 pretax purchase. You can spend all $35 on the beauty side or split your order between the beauty and drugstore side, because the sites share one cart. It will require at least $10 to be spent on the Beauty side to qualify for the offer. Do not forget to add three free samples into your cart that are eligible with every beauty purchase. There is no coupon code for this offer, but you can receive the offer by following this link. It will automatically load into your cart as long as there are no other offers in your cart or the link allows the other offer to be overwritten. The retailer does not allow more than one promo code. Erno Laszlo Offer. Do not forget to use ebates! Both sites accept it, and ebates sends you free money just for shopping with their links. It is my favorite way to shop. I like getting paid for what I love to do. View my main page for the guide map to the site and deeper deal exploration.